Tired of having your lettuce go bad before you get a chance to use it? Here's how to store loose leaf and head lettuce, so it stays fresh for a week or more. Wash your lettuce, and remove any damaged leaves. Do this even if you bought bags of prewashed lettuce. They're known to carry E. coli. Dry your lettuce thoroughly. If you have a salad spinner, use it to dry your lettuce. It'll remove the excess water, without bruising the lettuce. 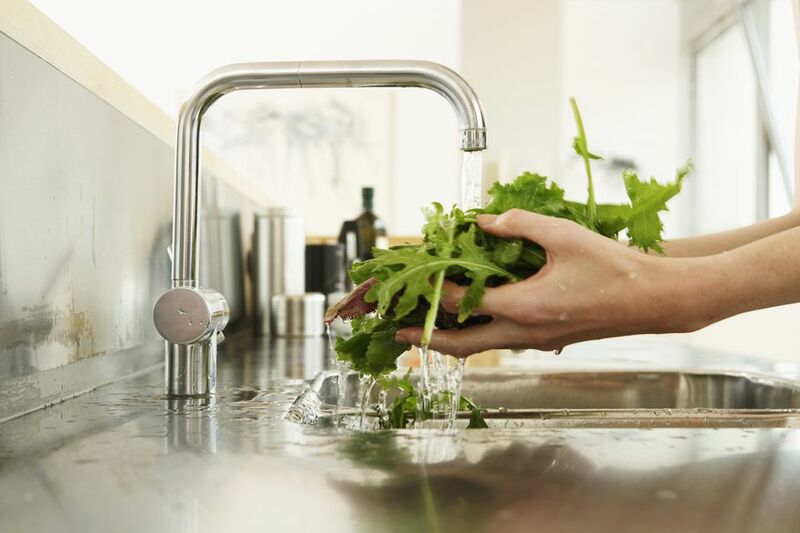 If you don't have one, just gently pat the lettuce dry with a paper towel or dish towel. Wrap the lettuce in dry paper toweling, and place it in a plastic bag or storage container. You can reuse the container it came in, as long as you wash it first. To maintain the proper temperature and moisture level, store your lettuce in the crisper drawer in your fridge. Replace the paper towel anytime it feels especially wet. This is the key to keeping your lettuce from getting slimy. Check your lettuce every day or two, and remove any leaves that are beginning to go bad. This will keep the rest of the lettuce from spoiling. Leave the heads intact and unwashed until you're ready to use them. Then, place them in the crisper drawer in your fridge with some paper towels. They'll absorb any excess moisture, so your lettuce doesn't spoil prematurely. Swap out the paper towels as they become soggy. Illustration: Melissa Ling. © The Spruce, 2019. If your lettuce starts to wilt, you can restore its crispness by soaking it in ice water for a few minutes before you use it. In general, loose lettuce leaves should be used within 7 to 10 days. You probably won't have much luck storing them longer than that. Heads of lettuce have a longer fridge life. Expect them to last one to three weeks, depending on the variety. Tight heads, such as iceberg lettuce, keep the longest. Don't toss a whole head of lettuce just because the outer leaves are starting to look past their prime. If you peel them off, the rest of the head should be just fine. Defer to your senses when it comes to deciding whether your lettuce is still okay to eat. If it smells bad, looks gross, or feels slimy, toss it out—or compost it—and buy more. Your health is worth more than the couple bucks you'll spend on more lettuce. If you eat a lot of salads, consider growing your own lettuce. It's easy to grow, and if you harvest your lettuce right before you eat it, you can skip the whole salad storage drama. To maximize your harvest, only pick the outer leaves from your lettuce, rather than picking an entire head of lettuce. As long as you don't disturb the crown, it'll continue to grow back again and again. That grocery store lettuce sure doesn't grow back after you eat it, now does it? Save yourself some money and fridge space, and give growing lettuce a try. Lettuce bruises easily, so be careful not to shove other foods up against it. Using a storage container is better than a bag, which can end up squished against other items. Make sure your lettuce doesn't get pushed to the back of the fridge, where it might be prone to freezing. If it takes you a while to eat a head of lettuce, you may want to consider buying Romaine or Iceberg lettuce. They tend to stay fresh longer than other lettuce varieties. What Is the Best Way to Freeze Fresh Dill? Does Powdered Milk Ever Really Go Bad? Can You Use Still Use That Jar of Honey? Did You Know You Can Freeze Fresh Ginger Root to Use Later in Cooking?